Details - Shards of Stasis - Updates - WAKFU, The strategic MMORPG with a real environmental and political system. Bombs have 20% of their summoner's HP. Bombs do not block line of sight. When Bombs explode, they do damage in a 2-cell circle depending on their Combo level and their summoner's Masteries. Bombs gain +5 Combo per turn on the field (a maximum of 2 times). A Bomb explosion gives back 1 WP. The number of Bombs on the field is limited to the number of Control Points. There cannot be more than 3 Bombs of the same element on the field (per team). Bombs have 150 Resistance in their element and 0 Resistance in other elements. Per level of the Rogue, they gain 2 Resistance in all elements. Bombs do not explode when they are destroyed. Bombs are considered Direct Damage: They do not bypass Armor, Block, or Barrier. A Powder Wall remains on the battlefield for 2 turns. The Powder Wall's element, damage, and effects depend on the targeted Bomb. Damage and effects are inflicted on targets that start their turn on it. Damage has a value of (3 AP) + (0.6 AP) per Combo. A Fire-type Wall removes 2 Range, Earth removes 2 MP, and Air removes 1 WP. Damage from the Powder Wall bypasses Armor, Block, and Barrier; it is Area/Close-Combat damage by default, but can become Area/Ranged with a passive. Each Combo point increases the Bomb's base damage, with 1 Combo equaling 10% base damage. The visual size of a Bomb increases with the Combo level. The max Combo for a Bomb is +15. This maximum may be increased with a passive. When a Bomb explodes, it causes any other Bombs in its area of effect to explode in a chain reaction. When several Bombs of the same element explode, each of their Combo bonuses are added together. For example, if a 4-Combo Bomb and a 2-Combo Bomb (of the same element) explode simultaneously, they will both do damage equal to 6 Combo. The Combos of bombs of the same element are also added together for single-target detonations. An effect that only applies to the next action. This includes when the condition is not met, meaning that any other action (another spell, movement, or the end of a turn) removes the Connection bonus effect that could have been used. 3-4 Range (modifiable), line of sight, 2 casts per target. (2 AP) Fire Health Steal (100%). Reduces Damage suffered by the targeted Bomb and restores HP. 1-6 Range (fixed), line of sight, 1 cast per turn on an empty cell. (4 AP) Fire Damage and -2 Range. 1-3 Range (modifiable), line of sight, 3 casts per target. 4-10 Range (modifiable), line of sight, 3 casts per turn, in a diagonal line. Bombs in a straight line are drawn 5 cells toward the targeted cell. 2-6 Range (modifiable), line of sight, 1 cast every 2 turns, in a straight line. -100 to -3000 Armor to the target. (4 AP) Fire Damage. Consumes all WP and increases (2 AP) Fire Damage for each WP consumed. 1-3 Range (fixed), line of sight, 3 casts per turn, in a straight line, in an area of effect (3-cell line). (3 AP) Earth Damage in a 3-cell straight line. The Rogue moves back one cell. Connection: Increases HP reduction for the next area-of-effect spell. 1-4 Range (fixed), line of sight, 2 casts per turn, in a straight line, in an area of effect (1- to 3-cell cone). (4 AP) Earth Damage in a 1-3 cone. +3 Combo to Bombs in the area of effect. (3 AP) Earth Damage and -2 MP. 2-4 Range (fixed), without line of sight, 2 casts per turn, in a straight line, in an area of effect (semicircle). (4 AP) Earth Damage in a semicircle. Base damage *1.75 in critical hits. Connection: Reverses the odds of a critical hit. 1-3 Range (modifiable), line of sight, 1 cast per turn, in a straight line, in an area of effect (1-cell circle). (3 AP) Earth Damage in a 1-cell circle. If the spell is cast at the beginning of the turn: Damage is doubled, but the spell cannot be recast for 2 turns. 1-1 Range (fixed), 3 casts per target. Connection: Lowers the cost of Barbecued Ribs by 1 AP. 1-1 Range (fixed), 2 casts per turn. Connection: Adds (4 AP) Air Damage on Barbecued Ribs. Connection: 200% Health Steal on Slap Shot. 1-3 Range (modifiable), line of sight, in a straight line, must target a Bomb. Gets closer to the target (5 cells max). (2 AP) Air Damage. Connection: Makes the Rogue immune to bomb explosions. (2 AP) Air Damage and -2 WP (1 turn). 1-4 Range (fixed), line of sight, 1 cast every 2 turns, in a diagonal line, must target a Bomb. Teleports to the other side of the targeted Bomb, at equal distance. Connection: Adds (3 AP) single-target Air Damage to the next spell cast in an adjacent cell. Inflicts (4 AP) Air Damage. Recreates the last Connection created. 1-6 Range (modifiable), without line of sight, 2 casts per turn. Can set off a Bomb, inflicting Area Damage. Can set off Bombs close to an opponent, inflicting Single-Target Damage. Automatically unlocked when a Bomb summoning spell is in the deck. 1-6 Range (modifiable), without line of sight, 1 cast per turn, must target a Bomb. Damage from Badabang is 25% higher than that from Detonation. Unlocked by a passive (replacing Detonation). 1-4 Range (fixed), without line of sight, 1 cast every 3 turns, must target a Bomb. Switches places with the targeted Bomb. +2 Combo. 1-6 Range (fixed), without line of sight, 2 casts per turn on an empty cell, in a straight or diagonal line. Moves the Bomb to the targeted cell. +2 Combo. The Bomb to be moved will be the one closest to the Rogue on the same line or diagonally from the cell targeted. 1-4 Range (modifiable), without line of sight, 1 cast every 3 turns, must target a Bomb with at least 1 Combo. Places Powder Wall glyphs on each cell between Bombs that are in a straight line or diagonal to each other. 1-1 Range (fixed), line of sight, 1 cast every 4 turns on an empty cell. Summons a Boombot on the cell. 1-4 Range (modifiable), without line of sight, 1 cast every 2 turns, must target a Bomb. The targeted Bomb will explode if it is destroyed, or at the start of the Rogue's next turn. If it explodes in this way, +10 Combo. Cast on self, 1 cast every 3 turns. Applies the state "Smoke Bombs" to the Rogue (2 turns). Smoke Bombs: When the Rogue's Fire spells are cast diagonally, their effects are extended by 2 cells, and their damage becomes area-of-effect damage. Connection: Doubles damage from Cross Fire. Unlocks the Boombot's Reconversion spell. Level 2 – The Boombot gains an additional 1 AP and 2 MP. The spells Ruse, Powder Wall, Boombot, Dynamite, Detonation, and Badabang gain 2 Range. Level 2 – Increase in values only: 2 Range -> 3 Range. Bombs gain an additional +2 Combo per turn on the field (+7 instead of +5). Level 2 – The max Combo for a Bomb increases to +20 (from +15). Increases the Powder Wall's Damage by 15%. Increases the maximum size of the Powder Wall by 2. Level 2 – Increase in values only: +15% Damage from Powder Wall -> +25%. Increases the Rogue's HP by 150% of its level. Bombs now have 30% of the Rogue's HP (instead of 20%). Level 2 – Increase in values only: 150% -> 300%. 30% -> 35%. Unlocks Badabang, which replaces Detonator. Level 2 – Badabang can be cast on an ally: +30% Damage Inflicted (1 turn) to the targeted ally. Bomb explosions and Powder Wall now deal Ranged damage (instead of Close-Combat). Level 2 – Bombs' maximum Range is 3 (instead of 6), but the Range is now modifiable. The Rogue gains (1 AP) Armor for each Connection used. Level 2 – Achieving 5 Connections unlocks the Longsword spell for one use. Dynamite can also be cast on a target (ally/enemy), and on the Rogue. The target becomes Stabilized, immune to Bomb Damage. For each Bomb explosion suffered, the target deals 10% more damage (1 turn). Level 2 – Increase in values only: 10% Damage Inflicted -> 15%. +1 Combo to Bombs placed. Level 2 – Increase in values only: +1 Combo -> +2 Combo. 2 AP – 8 MP – 1 HP – Does not copy any of the summoner's characteristics. – Cannot lock. – Cannot be locked. – Does not block line of sight. – Does not evolve with the summoner's level. – Dies at the end of the turn. 1-6 Range (fixed), without line of sight, target must be a Bomb. Can be used to set off Bombs near a target, dealing Single-Target Damage. 1-1 Range (fixed), must target a Bomb. Carries the targeted Bomb. Gains +2 Range on Bombs Away. If the Boombot dies while carrying a Bomb or target, the bomb/target is placed on the cell. 1-4 Range (fixed), without line of sight, must target an empty cell. Throws the carried target on the targeted cell. Throws the carried Bomb on the targeted cell. Requires a Bomb or target being carried. 1-6 Range (fixed), line of sight, must target a Bomb. 1-6 Range (fixed), must target a Bomb. Turns into the targeted Bomb, with the same max and current HP, Combo level, and the states Barbed Fire and Dynamite. The Boombot is destroyed, ending its turn. Monsters have higher HP, but they deal less damage. Monster HP and damage have been drastically lowered so that Stasis 21 is more accessible. Monster HP increases at a less exponential rate. Monsters' damage has also been slightly reduced. Experience gained and loot rates have greatly increased, thus providing better rewards for higher-level Stasis dungeons. Combat modifiers for levels (also known as "affixes") are now bonuses granted to players instead of effects to be avoided. They are still entirely optional, but when used well, they can significantly speed up combat or make it easier. You'll have to see the effects of these modifiers in game! There are new combat modifiers for Bosses that depend on the Boss's archetype. These modifiers replace the old combat modifiers for Bosses (previously called "Stasis Gameplay"), as well as the old Speed bonuses that Bosses had access to. The new modifiers have effects that occur based on the Speed bonus, so on turns 4, 7, 10, and so on. These combat modifiers often compensate for a Boss's weak points and serve to limit strategies that could become overpowered in higher Stasis levels. Both Speed bonuses (turns 7, 13, 19, and so on): Destroys nearby Summons and mechanisms (5-cell circle). Ultimate Bosses will now be doable in Stasis 21 and up. They cannot be done in Stasis 10 and lower. Competitive mode and ranking are now available for Ultimate Bosses. They'll also provide new rewards, detailed below. Ultimate Bosses must now always be completed at level, either by being the proper level or by using the level adjustment system. This change is designed to make Ultimate Bosses once again a real weekly challenge for the community. The level of Force of Will required for the boss fight has been reduced from 70 to 50. The boss's HP has been reduced from 1,000,000 to 800,000. The boss's Elemental Mastery has been reduced from 5200 to 4200. Nogord can now cast the spell Prismatic Wrath if he doesn't touch a player character during his turn. 1 new epic rune and 1 new relic rune have been added to the end-of-season chests. The end-of-season chests for Ultimate Bosses contain epic and relic runes that are different from classic end-of-season chests. 8 new epic and relic runes can be obtained from these. The way end-of-season chests work has been modified to work more like battle chests. Each character in the ranking will now only receive one end-of-season chest per dungeon, but these may contain more rewards than before. Each new Ultimate Boss may now drop a new unique item, but only in Stasis 21 or higher. Kamas are now stored at the account level (per server), and so they will be shared among all characters. That means you no longer have to exchange kamas between your characters, as they will all have access to the same kama wallet. No matter what character you log in with, you'll see the same kama total. This change serves to improve playability with heroes, or with several characters on the same account, while also improving technical operation and security. The kamas you had on each character have been added together. The account chest will no longer store kamas. The maximum total of kamas you can store has increased and is no longer reachable. These changes have led to limits being raised on certain features, such as the kama threshold when trading and the maximum tax in Marketplaces. The threshold for Clan Members, guild chests, and nations will stay the same. The interface that displays on hovering over combat swords has been updated to be fuller. There is a single interface for both combat swords containing all the information. Combat status: Positioning phase or combat phase. Time: The time remaining to join (positioning phase) or total combat time (combat phase). The total level of each team. Fighter type: Character class, monster family, and a new icon for companions. A character's guild, if the character is in a guild. Fighter status: A character that is dead or KO'd has a skull-and-crossbones icon. Also, particles above the swords will indicate whether a team is requesting help or has locked the fight. You can now double-click to add a rune or a Smithmagic hammer to be improved in the rune upgrade interface. Runes will be put in the second slot first; this slot can only contain runes. Double-clicking on a Smithmagic hammer can also replace a rune that is slotted in the first slot. It is now possible to confirm a rune upgrade before the Enter key. When a rune reaches max level and the interface closes, a message explaining why will appear. It's now possible to see the description of runes and powders in the Runic Recycler. The term "Gem" will no longer be used anywhere in-game in relation to Smithmagic. "Rune" will be used in its place. The number of days a guild member has been inactive is now displayed when you mouse over the member's nickname in the guild interface, if said player has been offline for over 24 hours. The maximum number of members a guild can have is now indicated when you mouse over the number of members in the guild interface. When the field for inviting a new member is empty, the invite button is grayed out. When an attempt to invite a new member fails because the maximum number of members has been reached, the player who initiated the invite will receive a notification informing them of this. A progress bar, along with a text display of the time remaining, will now appear when you purchase new guild bonuses or construct Haven World buildings. The button for buying a guild bonus or increasing the guild level has been updated visually. There is now a confirmation step when you disband a guild: You must type out the name of the guild. When disbanding a guild, a notification is sent to any online members. Error messages that display when confirming the choice of a new guild name or emblem will appear in a pop-up window, no longer only in the chat box. A guild name/emblem change properly applies to heroes in groups and in the hero interface. A guild name/emblem change no longer triggers a notification indicating that the guild just acquired a Haven World, if the guild already had one. Counters in the profession interface have been improved. The number of seeds and resources harvested for the Trapper profession will no longer reset each time you log back in. The resource counter for the Fisherman profession now properly increases when fish are harvested. In general, counters have been streamlined in terms of location and function. All counters will now properly update in real time. Dragging an item moves the entire stack; holding Shift while dragging the item lets you choose how many items to move. Dragging an item lets you choose how many items to move; holding Shift while dragging the item moves the entire stack. Clicking on a pet while the pet management interface is already open will no longer close the interface; it will update with the newly selected pet. On items, resistance and damage of the same value will now show up on the same line. When selecting an item for heroes, compatible equipment slots will once again be highlighted properly. The size of the button that lets you fold/unfold advanced characteristics is now larger. The characteristics Damage Inflicted, Heals Performed, and Critical Resistance are correctly saved when added to the characteristics toolbar. The default build is now called "Build" instead of "Build 1." Importing a spell deck will no longer reset the name of the spell page. Changing a build's level using the automatic spell page will now correctly update the page in the spell interface. The icon for Glory Orbs in the PvP tab of the passport has been updated to match the one in the Battlefield rewards interface. The "Collect rewards" button will no longer appear on the post-Battlefield menu if no reward was granted. The knights will once again face each other in the menus displaying before and after a Battlefield. The nation that wins or keeps the territory will now be shown in the center of the post-Battlefield menu, as well as in the combat recap in the main Battlefield interface, for the sake of clarity. The notification for launching a Battlefield will now be properly sent to all three players concerned. A protector's nation is now shown when you mouse over their portrait. When unlinking a sidekick, while it is free this week, its level will be updated as it should. When using a "Sidekick" item, the cost in Ogrines of other Sidekicks will no longer vanish. Sidekicks that cannot be purchased will no longer have the "Buy" button displayed below their portrait. The "Buy" button will no longer be larger than the background image. 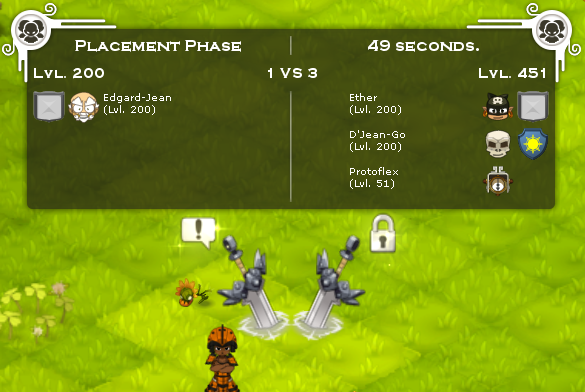 A sidekick's health bar will properly update in the group interface, during combat, and at the end of combat. The background, font, and color of the error message appearing when you mouse over the button to add a Sidekick to the group have been made more readable. There is now a confirmation message with a summary of information before you put an item up for sale in the Marketplace. 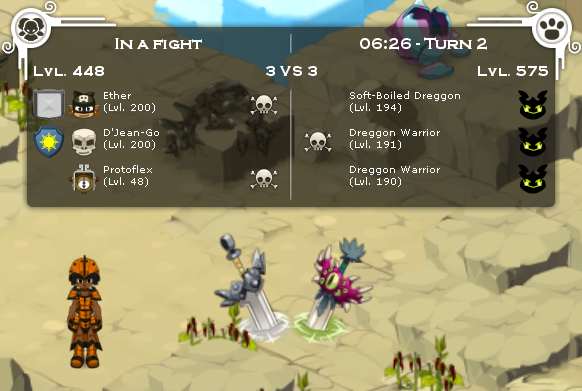 Mines and Hour Cells will always be shown during their owner's turn and that of their Summons, regardless of what mode for displaying areas of effect is selected in the settings. It is now possible to stop tracking Almanax quests in the same way you can with normal quests. However, quest tracking will reactivate on the next login. Notifications during a server shutdown will now display on login, as well as every 5 minutes during the last half hour. The Booster interface will display the correct duration of remaining Booster time, especially in cases where the server time was very different from France time. Each costume will have a button to try it on in the in-game shop. The button for previewing pets in the in-game shop will let you display the pet interface. The Clan Member interface will no longer be displayed in Incarnam. Pressing the Insert key will no longer make the game menu appear. Ultimate Bosses now have a unique dungeon door in the the dungeon interface. The tutorial icon for Silos will properly display. The dungeon access interface will now be displayed and grayed out if the character does not have the necessary level (instead of being hidden). Technical improvements have been made to the saving and loading of Haven Bag chests and account chests. This won't have a major impact on client performance, but there could be a slight improvement in network consumption for these elements. Matrix calculations have been optimized to consume fewer resources. These calculations are used in most display processes, so you're likely to see a positive impact on the game. The client will no longer freeze during Ogrest's Chaos if no audio device has been enabled. Mousing over certain NPCs will no longer cause massive lag for the client. The Masked Spirit spell bar will properly reset after the Masqueraider rejoins combat. The description of Fogginator no longer says an HP reduction occurs at the end of a turn when it occurs at the start of a turn. The Constitution passive will no longer cause characters to be resurrected when the Eniripsa quits a fight. Finishing off an opponent with a Fire spell will apply a Mark before they are KO'd. Sidekicks can no longer trigger the Here Mark when this is supposed to be triggered only by Summons. Enutrof area-of-effect spells now apply a resistance loss on Mines to all targets in the area, but this resistance loss has been halved. The Enutrof will receive a Dodge increase in Drhellzerker form if they have the Drhellzertank passive. The Drheller's Minedog will now follow the rules concerning distance between Mines while they are being created or moved. The Advanced Geology passive no longer adds a line of sight to the Mine Mover spell. The Advanced Geology passive will properly place a Mine under the Enutrof at the start of a turn, even if there is a Mine belonging to an Enutrof ally nearby. The Mirage spell will no longer be limited to 2 casts per target under Heart of Fire. The Principio Valere spell effect now correctly teleports the character to the closest Will-o-the-Wisp. When Armor is applied to an ally with the Feca Master passive, the resistance received will correctly depend on the ally's weakest resistance, not the Feca's. The Pandawa's Milk Cloud will no longer be removed when a Feca uses the Teleportation spell. The effect of the K'mir spell "pulling its target" will be cancelled when its targets passes through an Eliotrope portal. The HP bonus from the Poisoned Blood passive now works the same way as other class passives. It applies an HP bonus equal to 100% of the Treacherose's level per ally in combat. Time Rift will now heal for the correct amount when a critical hit is landed. In the fight with Ogrest, it will no longer be possible to maintain the Inversion state after the Turquoise phase. A character can no longer join a fight when in spectator mode. Monsters with spells that do chromatic damage will use them correctly. For example, the Pink Piwi. The number of points earned will no longer be unusually high when members of the opposing team are KO'd the moment the fight ends. Quitting a fight will properly award points to the opposing team. Old runes and powders will disappear from player inventories after the update. Players with any in their possession must turn these into new ones before the update. Obtaining the title "Hardened Hero of the Nation" from the dungeon machine will no longer require an Old Gobbowl Token. The Confidence Relic Rune works differently now: The Block bonus will be active when combat starts. Also, "health steal" healing will no longer count as a heal that can cancel the Block bonus the following turn. Mori Memento Fragments will be available from the YeCh'Ti'Wawa dungeon machine. Bonuses from Vitality consumables no longer stack, also Vitality bonuses no longer stack with Dodge, Lock or Initiative bonuses. Seasonal event recipes will only be available during its season. Guilds can no longer be created by spending 10,000 kamas. A Guildalogem will be required to create a guild. Besides a world drop, the Guildalogem can now be obtained from a Discovery achievement by completing a number of objectives in Astrub. The icons for the Pumpkwin and Jacko costumes are no longer identical. The shield will no longer be invisible when the character wears a Reindeer Costume while in a fighting stance that should allow shields to be shown. The Flux Costume shoulders have been repositioned slightly so as not to stick out in front of the hat as much. Female characters' hair will no longer disappear with the Voice Thief Costume. The size and color of the Environmental Quest chests for the Buried Treasure of Calamar Island have been updated to better match the area's atmosphere. The Bow Meow, Tofu, Boon, and Godron mounts will now have a jump animation when the character leaps over crevasses using Jumpin' Gap Jacks. Ghostofs in the Three Pistes Dungeon now have a portrait in the timeline instead of the generic portrait. The image of Captain Calamari's dialogue now has a black border. Percedal now has a death animation. A character's hair is now hidden when they are wearing the Father Deepboar Costume. There are new stationary positions common to all classes and that the male Eniripsa and female Xelor were missing. Master Shhhudoku's portrait in the dungeon launch menu now has the right color. Random animated behaviors have been added to Voodoo Kanniball and Kanniball Lymi. The game's music will now get quieter when a player uses a musical emote. The sound of the Runic Recycler will now only play when the machine is working, not when the interface is opened. A sound will be played when placing or moving a marker on the map. Monsters will always choose their own Speed bonus. They can no longer use that of other monsters on their team. The amount of kamas earned at the end of combat will no longer be influenced by the area Clan Member's satisfaction. Moving around in the world can no longer be disrupted by Haven Bags having been deleted from a cell that contains an obstructive resource (e.g. a tree). It will no longer be possible to equip spells in an automatic page whose level isn't supposed to allow it. When a new Haven Bag Kit is learned for a hero, the kit will be properly added to the list of the hero's kits, not the main character's. The Haven World Forge will correctly provide a bonus to the Weapons Master profession, and no longer to old professions that don't exist anymore. It will no longer be possible to remove a Haven Gem containing certain interactive elements, such as dummies. Incarnam will be properly instanced. Each Incarnam instance can host up to 30 characters. It is once again possible to delete a character that was restored. The compass of the first wind turbreeze for the contract "Don't Break Wind" from the Gnashville mercenaries of Brakmar will point to the right objective. Some players experienced having a turn of 10 seconds instead of 30 seconds or less. This issue has been corrected. If you still experience this issue, please contact the Support team.